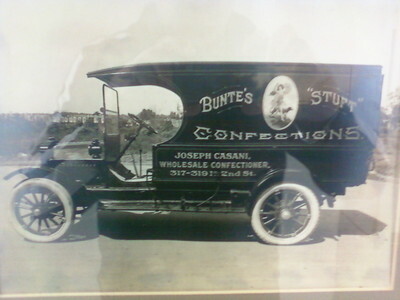 Home - CASANI CANDY CO. When Milton Hershey decided to make a chocolate bar in 1903, he asked Casani Candy Co. to handle its distribution throughout Philadelphia. Casani became the Hershey bars first customer... When Henry Heide invented Juicy Fruits in 1869, he counted on Casani as well. 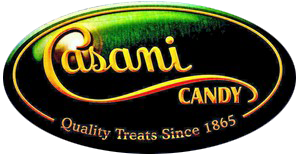 Casani Candy Co. was founded by Henry Jonas in 1865. In 1882, Jonas hired Joseph Casani as a bookkeeper. And by 1908, the two became partners. Jonas died in 1913-- leaving Casani in possession of the business. The firm has always been aggressive, and was the first company to replace the horse and wagon with a fleet of trucks. In 1947 John Lees joined the company as an office boy and go-fer. Casani taught Lees the business, and told him in the late 1960's that he was going to take over, and in 1973, he did just that. Casani suffered a stroke in 1978, and died five years later at age 82. John (Jack) Lees has always been involved in the candy industry activities as well as running the company. He has been Chairman of the annual Philadelphia Candy Show. His colleagues have awarded him the Hook Award as well as the Copper Kettle Award. He is a trove of candy industry lore. Jack was born and raised in the Port Richmond section of Philadelphia. He was 1947 graduate of North Catholic High School, and served in the army during the Korean War in the 501st Harbor Craft Company from 1951-1953. Jack joined the Casani Candy Company in October of 1947 and served as an office boy and all-around gofer. Before being drafted in 1951, Jack moved into the sales force at Casani Candy, calling on retail accounts and various department stores throughout the Delaware Valley. Upon his return from Korea in 1953, Jack married his first love Beatrice and resumed his position at Casani Candy working his way up the ranks until he purchased the company from John Casani in 1973. It was then that Jack became the fourth President in the history of America’s Oldest Candy Distributor. Jack was appointed Chairman of the Philadelphia National Candy Show in 1976 and served in that capacity until 2002, when it was acclaimed to be the largest show of its kind. When Jack became Chairman, the show had 69 booths and 35 exhibitors , upon his retiring from the candy show commitee there were over 375 booths. Jack was an active member and served on the board of the Retail Confectioners Association of Philadelphia. He was also a recipient of their prestigious Kettle and Hook awards. On a National level, Jack was inducted into the National Candy Hall of Fame in 1988. In 1995 he was nominated for the National Confectioners Associations Kettle Award. And in 2012 he was Presented by the National Candy Sales Association with the Distinguished Service Medal. Jack served as Chairman of Distributors Advisory Council for the Candy Hall of Fame from 1990-2015. Jack was a member of the Charles Carol Council Knights of Columbus and served as Grand Knight for two years. He was an active member of Old St. Joe’s Parish in Philadelphia until his death. A man can only be as lucky as Jack to have a second great love come into his life, he married Patricia Coughlin Pierson on September 27, 2013. Jack and Pat remained a devoted husband and wife until his death. Jack is survived by Jack(Deborah) and Joseph(Francine) along with Patricia’s sons Gary(Beth), Greg(Stephanie), Christopher(Bridget),Steven(Hallie) and a total of 17 grandchildren and 1 great grandchild. He is also survived by his brother George as well as many nieces and nephews. He is predeceased by his siblings James, Isabell, and most recently Marie. Relatives and friends are invited to his viewing Saturday November 3,2018 at Holy Innocents Church 1337 E. Hunting Park Avenue Philadelphia, Pa 19124 from 9:00 AM - 11:00 AM. Funeral Mass 11:00 AM. Interment New Cathedral Cemetery.